Would you trust a stock analyst who does not invest in stocks? Or an insurance agent who does not buy insurance for himself? That’s why as a food blogger, I always believed that learning the art of cooking is essential in better appreciating the complexities of the various cooking styles and its execution, as well as to understand the subtleties of flavors and tastes. I think that’s definitely the way I would like to progress as a food blogger, developing my palate by getting my hands dirty. 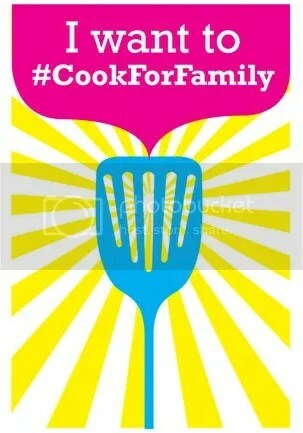 So when fellow food blogger, Daniel from Daniel’s Food Dairy emailed me asking if I would like to participate in his initiative, #CookForFamily, aimed at promoting family bonding by allowing the whole family eat out less and dine together more often at home, I readily acceded. Finally, time to get my hands dirty! 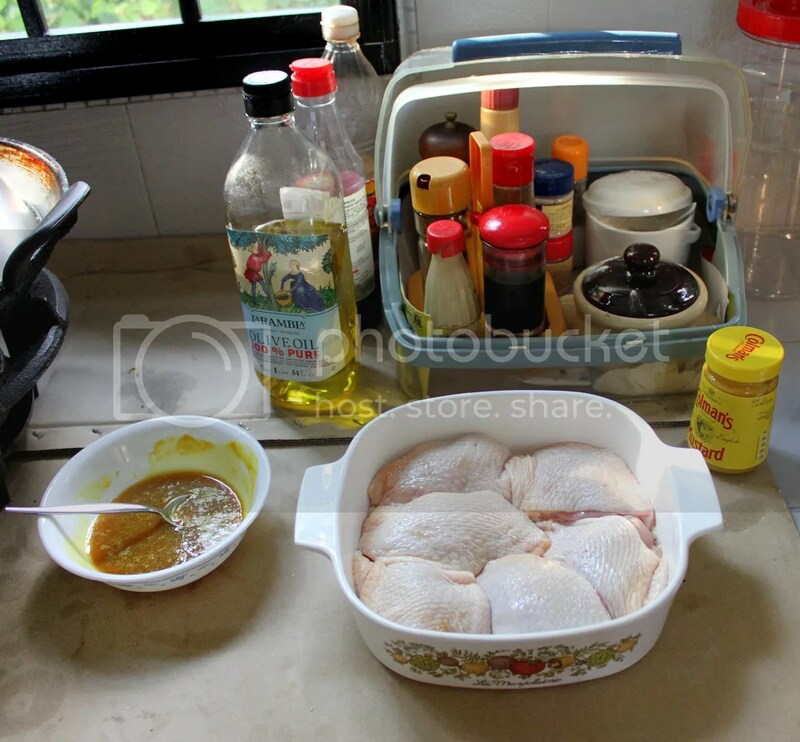 I was pondering yesterday on what I should cook for this initiative so I went online to search the various recipes on foods that I liked to eat, stuff like Braised Beef Cheeks, Coq Au Vin, Chicken Roulade etc but for someone who hardly cooks, I found most of the recipes a little too daunting. 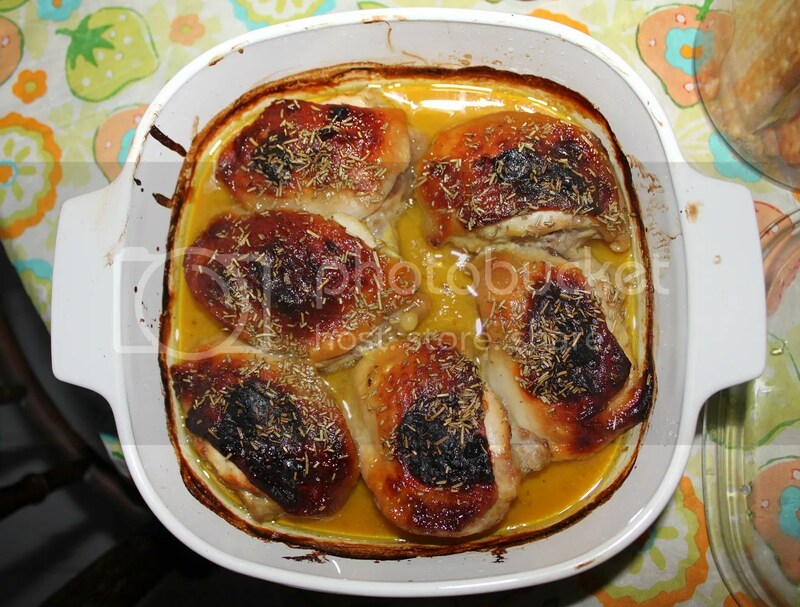 So I settled on a simple Oven-Baked Honey Mustard Chicken dish, something I could just throw into the oven and would not require too much skills or fanciful equipment. 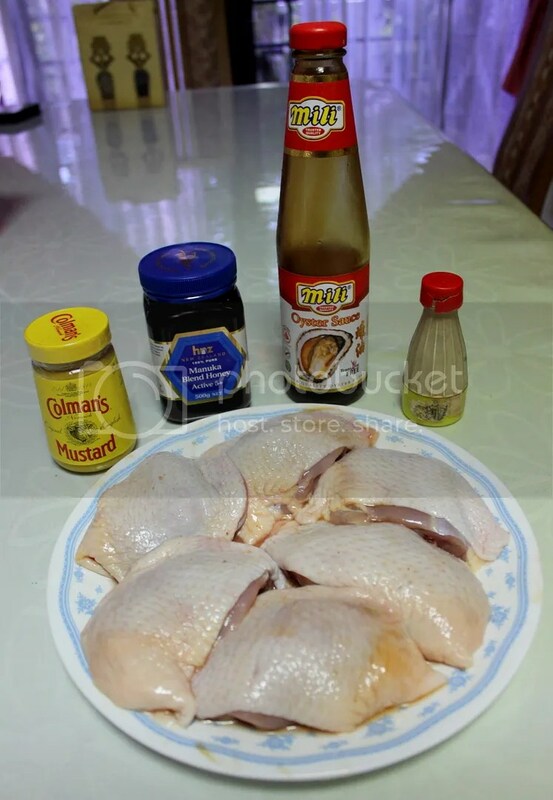 Rub the chicken thighs with salt, oyster sauce and white pepper and leave in fridge to marinate for a couple of hours. Notes: I was running short on time so I only left it to marinate for about half an hour. As such, the flavours barely infused into chicken meat, though the skin was alright. For more effective marination, leave it in the fridge for a longer duration and/or you could also slit an opening and rub marinade between the skin and meat. In a large bowl, mix the mustard, honey and olive oil. Add a pinch of salt and taste. Add more salt and mustard until you get the flavor where you want it. Notes: For my sauce, I used yellow mustard but if dijon mustard is available, I would advise you to use that instead as it has a more intense flavour which would better balance out the sweetness of the honey. 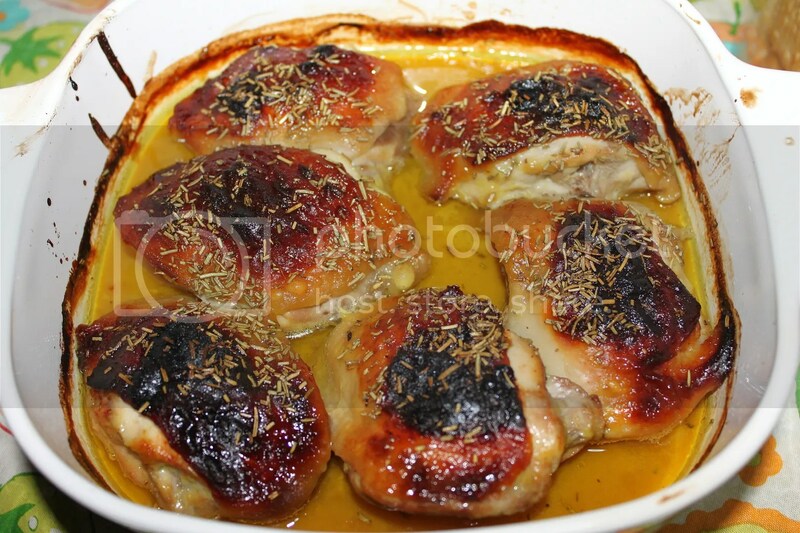 Place the chicken thighs skin-up in a shallow casserole dish. 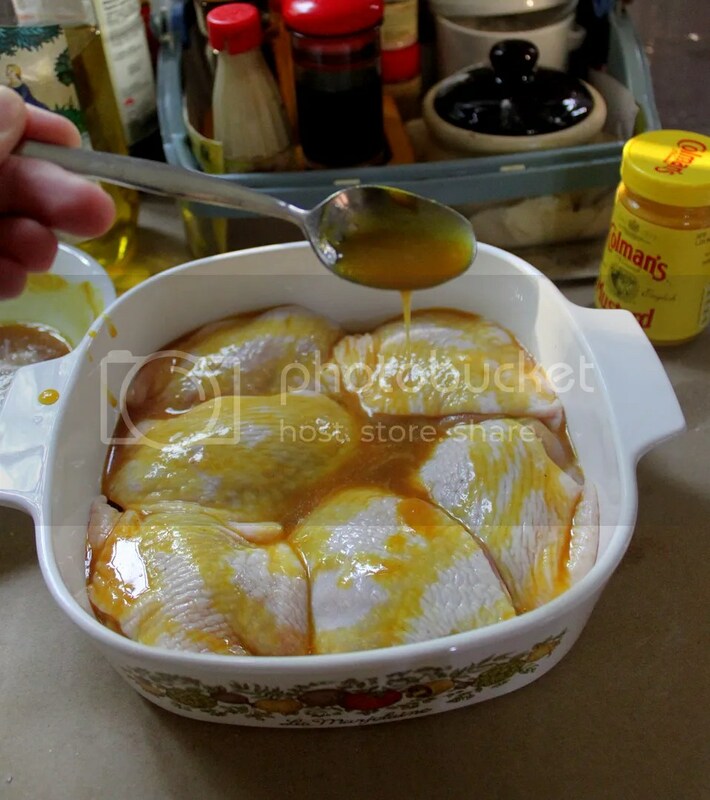 Spoon the honey mustard sauce over the chicken. Sprinkle the dried rosemary over the chicken thighs. 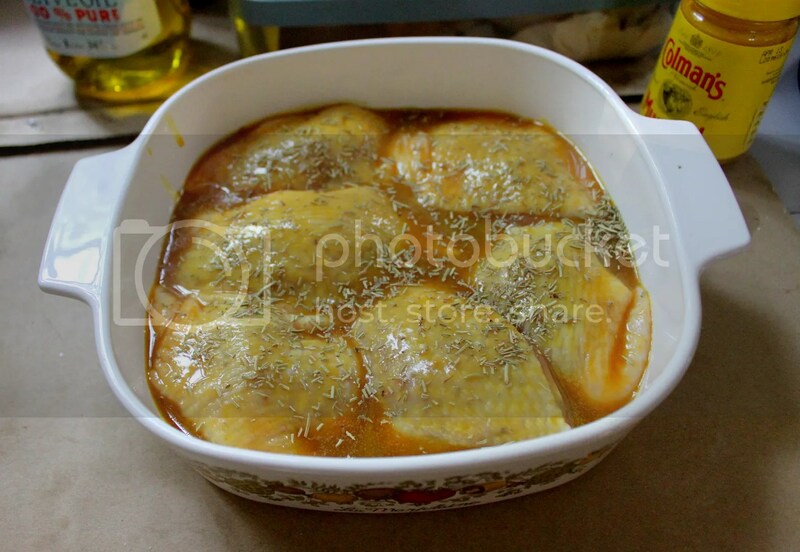 Bake for 45 minutes at 175 degree celsius, or till the juices run clear when the meat is pierced with a knife. You are done! Notes: Halfway through the baking, I realized the chicken was slightly burnt because the oven was set at 250 degrees celsius. To remedy the situation, I covered the casserole dish with an aluminium foil and set the appropriate temperature. That worked out well! Overall, I thought the experience was pretty good. It took me slightly over an hour to prep and cook the dish and I wasn’t too ashamed serving this to my family. The honey mustard sauce definitely goes well with rice with its mix of sweet, savoury and mild spicy tang. I’m feeling a little more confident now with this dish under my belt and will probably be showcasing more recipes in the near future!